Nick Foreman, MD, the Seebaum-Tschetter Chair of Pediatric Neuro-Oncology at Children’s Hospital Colorado, has been leading the way in moving groundbreaking kids’ cancer research from the lab to the clinic in Colorado for more than two decades. Dr. Foreman’s prescient decision to collect and store tumor samples means the Morgan Adams Foundation Pediatric Brain Tumor Research Program at the University of Colorado School of Medicine now has one of the largest pediatric brain tumor banks in the world. This has enabled doctors and researchers around the world to learn more about tumor types and customize a child’s treatment based on the genetic makeup of the cancer cells. 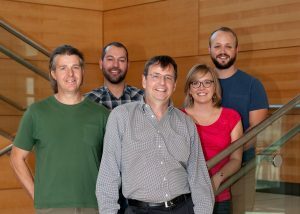 One of the most recent and exciting funding opportunities pursued by Dr. Foreman’s lab is international in scope. Dr. Foreman’s team solidified a transatlantic collaboration in the interest of securing a $9.6 million research and clinical trials grant provided through a joint venture of Stand Up to Cancer and Cancer Research UK, called the SU2C-CRUK Pediatric Brain Cancer Dream Team Translational Research Grant. In addition to Morgan Adams Foundation-funded researchers, the collaboration includes representatives from the University of Nottingham (UK), the University of Birmingham (UK), the German Cancer Research Center in Heidelberg, St. Jude Children’s Research Hospital, and the Gustave Roussy Cancer Institute in Paris. The grant, if awarded, would create a consortium, Targeting High-Risk Ependymoma, a Trans-Atlantic Consortium (THETAC), to develop more effective therapies for children with ependymoma. In recent years, the world’s leading biological and clinical experts in ependymoma have identified nine highly-distinct molecular groups of ependymoma that differ in many aspects, including biology and clinical outcome. With this knowledge, effective therapies can and should be tailored according to each molecular group’s underlying biology. In the proposed project, THETAC will test these new therapy approaches in ependymoma cell lines and lab models. The most effective therapies identified in preclinical experiments will then be applied to high-risk ependymoma patients in clinical trials, which will, for the first time, be conducted in countries on both sides of the Atlantic Ocean and will involve many American and European pediatric oncology centers. This will allow the trials to be run more quickly and for the benefits for children with ependymoma to be achieved sooner. The members of THETAC believe that developing therapies better targeted to the biology of the ependymoma subgroups is the only way to improve the outcomes for this high-risk patient population. THETAC has a strong commitment to continue its mission beyond the horizon of this grant to one day ensure a cure for every child with ependymoma. This collaboration was significantly strengthened by the researchers’ ability to discuss the project in person at the most recent meeting of the International Symposium on Pediatric Neuro-Oncology (ISPNO) in Denver this past July. The extremely fruitful partnerships that stemmed from this meeting and that further developed throughout the grant application process are a quintessential example of how crucial ISPNO and other international conferences are to furthering our global fight against pediatric cancer. We are—truly—all in this battle together. The team will receive word on the status of the application in September. We hope to have good news for you then, but please be assured that these international collaborations will not dissolve if funding is not achieved. On the contrary, researchers will press forward and onward to find the next funding opportunity. High-risk ependymoma has formidable opponents who, like our children, will never stop fighting.